For last week’s Elizabeth Amalie Rate the Dress I had one request: Please don’t look at the baby. Luckily looking at the baby resulted in a very entertaining set of comments. If the baby itself didn’t make you fall off your chair laughing, then Rachel’s imagined conversation with EA, and Mrs C’s all-too-apt Harry Potter reference were sure to! Beyond the most-unfortunate baby, Elizabeth Amalie’s dress was deemed very attractive, but not the most delicious creation of its time, coming in at 8.2 out of 10. I’ve just been to see the Reigning Men exhibition at LACMA* (11 word review: fabulous garments, slightly less fabulous curatorial choices, slightly overwhelming, totally worth it), so have menswear on the mind. 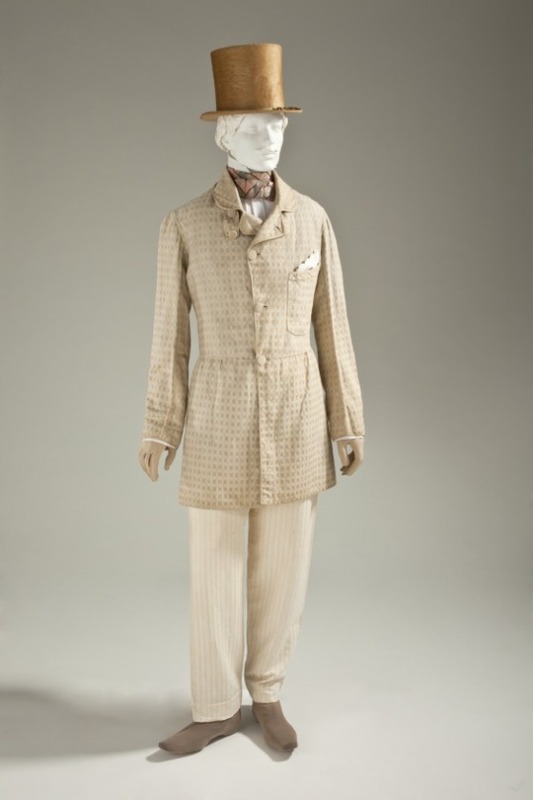 There aren’t that many museums that have a lot of images of fully assembled menswear outfits, so I’ve picked one that is from LACMA, though it isn’t in Reigning Men. This mid-1840s ensemble was made with hot summer temperatures in mind: light colours give the impression of coolness, while stripes in the trousers and supplementary warp patterning forming diamonds and squares in the jacket fabric adds texture and interest. Even the practically-mandatory top hat is made of straw, to keep everything breezy and fresh. 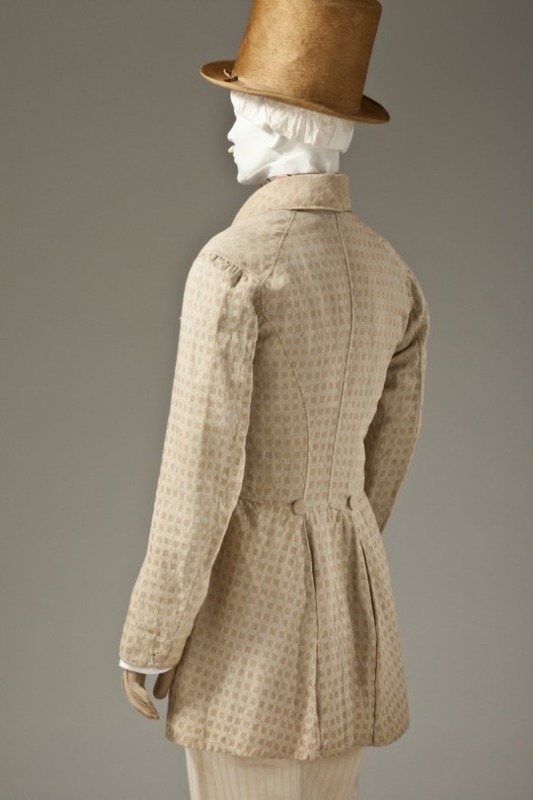 The jacket still has the more curvaceous silhouette of 1820s and 30s menswear, with an emphasis on the waist and a fuller skirt, and fuller pants. 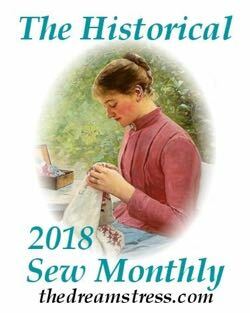 The far-back angled shoulder seam and wider collar roll that sits far away from the neck are other elements seen in earlier styles that will disappear as the century moves on. 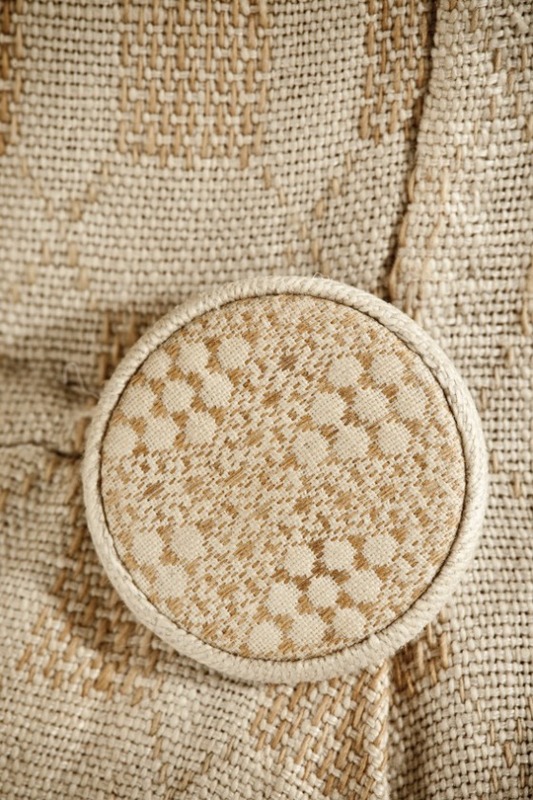 The patterning of the jacket is echoed in the large buttons of the jacket, which repeat the diamond motif, and bring in a spotted pattern. What do you think? Interesting without being ostentatious? Comfortable while still being elegant and formal? Or…no? I think this is stunning! And thank you for the detail button closeups, which emphasize how carefully the elements of this outfit were put together. I don’t think I’ve ever seen a straw top hat before, but it’s quite elegant. The straw top hats are fascinating aren’t they? Matsukaze Workshops did a blog post with all the ones he could find – it doesn’t cover this one, and I haven’t managed to find the direct LACMA link to the hat. I think the outfit as a whole could use a pop of dark color somewhere just to keep it from looking too drab. Also I don’t like the color of the hat combined with the color of the cravat/tie thing. I think it would look better if one of those was changed. Looking closely at the top hat, I think it’s beaver, rather than straw–I’m just not seeing the woven texture; it looks brushed, to me. I do like the outfit in general, although the slight puckering where the skirts of the coat is sewn on bothers me. I think the tab (leaf?) 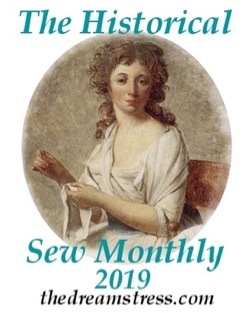 on the right side, under the collar, is an interesting bit, even if I don’t see how it works; likewise the size of the breast pocket, which may be unusual to our eyes, but I’ve seen a couple other examples on linen frock coats. And I rather like that you can see that the seams are felled to one side. 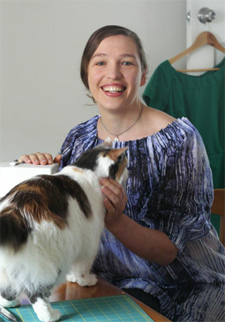 I agree with Sarah, as well–it does need a touch of colour. 8/10. You may well be right about the hat now that I look at it, though I could also see it as that very fine straw, which is what I interpreted it as. So frustrating that I can’t find the museum record for it. I hate it when museums don’t include ‘shown with x, x & x’ in their records. I considered leaving the museum a comment and asking, but decided I just don’t care enough. But yes, it is a pain when they do so. I believe I have seen that one as well. I decided to not include it because–as you said–it’s “almost” a top hat. That is frustrating that they have those entered into the online database, but don’t have photos. Very elegant, understated, and classy. I’ll give it a 9.5. I keep looking at the cut of the coat and connecting it with the frock coats worn by both male and female riders of American Saddlebred horses. I don’t LIKE IT much as an ensemble – it makes me think of those monochromatic mannequins you see in museum installations sometimes, too much beige and cream and pale. But on the other hand. I really do like it, but I’m not really much of a pale colours person. I like colour. I like the cut, but I tend to prefer longer cut skirts and to me, while this looks great, I feel like the coat skirt is truncated proportionally, like a 1950s dress lopped off to make it mini length – the proportions feel a bit weird to me. It is nice, but it bugs me a bit, because I feel like the proportions are off, and much as I would like to wear something similar, to me, I feel like the coat is just a bit too short-skirted, and everything else feels out of sync a little bit. The details are what make this… altho’ it still ‘reads’ as pyjamas to me. :^) Which, incidentally, is rather appropriate! Love the back seaming on the jacket and the fabric detail is lovely, altho I’m not a fan of the color. That Hat! Super Fabuloso! The pants are what make it ‘meh’ for me. A slim *8* from me. Boo, it ate my comment this afternoon, thought it was spam. Anyway — I never even thought of how to pronounce LACMA! As an LA native I’ve always called it Lahk-ma. Glad you got to make it to the menswear exhibit — I went for the Rain Room and my group wanted to leave with only seeing the Hawaiian feather exhibit. (I thought of your blog!). Wish I could’ve made it to Costume College but glad to see your pictures. For the outfit — it creeps me out for some reason! I give it 7/10. The colors are probably faded/yellowed so I can’t really complain about that — mostly the pattern and cut of the jacket and the strange way the straw hat looks just seems so off. I love the pants though! I like the way that this costume takes the elements of 1840s male fashion and transforms them by making each item in a pale, summer fabric and color. And I love the pattern weave of the fabric used to make the jacket (didn’t they call that garment a “frock coat” in period? I’m not sure); it would have made a splendid gown as well. Unfortunately, I don’t care for the silhouette of the 1840’s transitional jacket style. It tries to combine the fitted, defined-waist quality of the 1830s with the boxy look that came into its own in the 1850s and 1860s, and just ends up looking a bit too shapeless. The pale colors of the outfit make the shapelessness more obvious. So it’s not a 10, for me, but it’s not bad; I’ll say 7 out of 10. It looks great as a summer ensemble. Cool and fresh, but the texture of the fabrics keeps it interesting. For a relaxed summer day I think it fits really well. 8/10. Would be stunning on a dsrker-complexioned brunet. 9/10. I’m surprised at how much I love this. 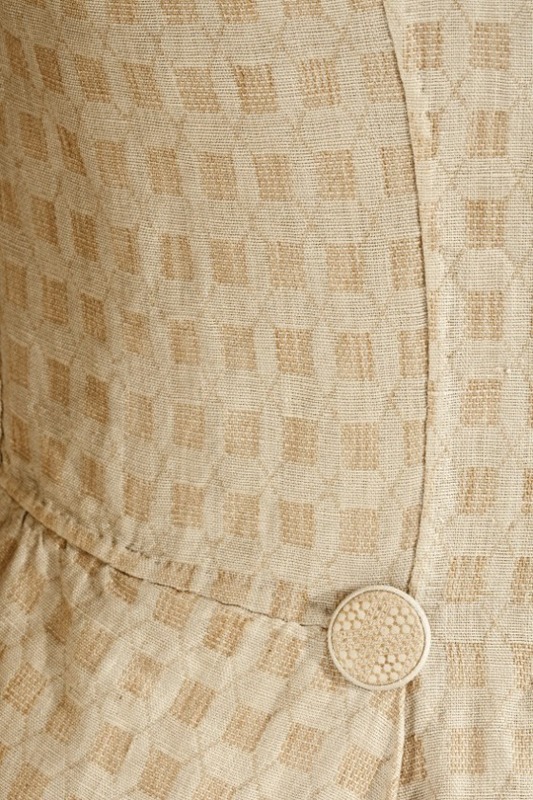 I usually am not that find of the first half of the 19th c., and the color is beige-ish, which is not my favorite. But I do love summer “whites”. I like the pattern of the coat, but like the pattern on the buttons so much more! The mix of stripes and squares makes the ensemble playful, I’m almost thinking “steampunk”. The single patch pocket and what looks like some flat felled seams add to a relaxed feel, fit for a summer picnic and maybe a lazy trip down a river in a row boat. Is that a storm collar tab?? While it fits a sporty vibe, I think of those a cold weather detail – hmm. Maybe I’m not seeing what it is. Not sure that hat is straw, but I have seen straw top hats, so I’m willing to pretend. 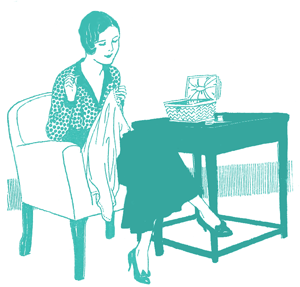 I would also prefer linen to cotton, for hot weather. In all its quirkiness, I find it somehow really endearing, and it gets a 9, perhaps more than it deserves.